We’d love your help. Let us know what’s wrong with this preview of Owling by Mark Wilson. 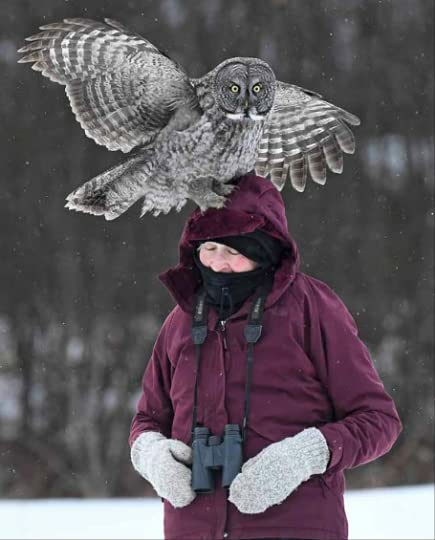 Wildlife photojournalist and nature educator Mark Wilson present From Hedwig, the Snowy Owl of Harry Potter fame, to Winnie-the-Pooh’s beloved friend Owl, this wide-eyed bird of the night has found its way into young hearts and imaginations everywhere. Owling invites young readers into the world of real-life owls, to learn about their fascinating behaviors and abilities. To ask other readers questions about Owling, please sign up. Owling is a fascinating children’s non-fiction book that offers a comprehensive introduction into lives of these remarkable birds. I was surprised to learn that owls’ huge mesmerizing eyes mean there is less space in brain, so the reputation for being all-knowing and wise may not be wholly deserved. I had no idea owl have twice as many vertebrae in their necks as we do and can turn their heads 200 degrees in any direction. The book offers a wealth of information on their binocular vision, ear tuf Owling is a fascinating children’s non-fiction book that offers a comprehensive introduction into lives of these remarkable birds. I was surprised to learn that owls’ huge mesmerizing eyes mean there is less space in brain, so the reputation for being all-knowing and wise may not be wholly deserved. I had no idea owl have twice as many vertebrae in their necks as we do and can turn their heads 200 degrees in any direction. The book offers a wealth of information on their binocular vision, ear tufts, sharp talons, and silent wings (there are specialized sound-dampening feathers). Young nature lovers also learn to distinguish between different owl species, observe these magnificent birds in nature and respect their habits. Gorgeous illustrations and well-thought-through layout will catch and hold the young readers’ attention. Owling would make a great addition to elementary and middle-grade school library. Thank you to NetGalley and Storey Publishing for the ARC provided in exchange for an honest opinion. What a fascinating book! This book covers everything you need to know about owls and more! Habitats, food, characteristics, types, where to find them and working with owls. I love that so many of the different types of owls were included in the book to compare with others. This would be an amazing book for an upper Elementary and above classroom as well as the library. Owling was a fascinating look at the life of owls. This book was written in a clear but detailed manner accompanied by photos that were outstanding and somewhat mesmerizing. I especially liked the chapter on how to find an owl and the educational activity related to it. It was quite a unique learning experience for the young children. This book should be a part of the school library where it can be enjoyed by children of all ages. Even if you think you don't want to know about owls, you should read this book. Even if you thought you knew everything you needed to know about owls, you should read this book. And even if you don't like reading "children's science books" you should read this book. Owling is a well written, middle-grade book with fascinating tidbits about Owls, from the way that their eyes work, to their ears, to how they build nests. Hint, they don't, they "borrow" other birds nests. Great pictures, and easy to Even if you think you don't want to know about owls, you should read this book. Even if you thought you knew everything you needed to know about owls, you should read this book. And even if you don't like reading "children's science books" you should read this book. Great pictures, and easy to read one page factoids, make this book a delight. I would highly recommend it for schools and libraries. And adults will enjoy it as well. A reference book rather than narrative nonfiction that includes an amazing variety of owls to learn about. Tons of photos make this a vibrant read! Right now I am not quite sure what to think about Netgalley books. Although most ARC books are getting ready to be published I haven't met so many in one place that hasn't been completed before it is passed onto the reader. In a sense it is a bit on the didcombobulating side. Take for example this particular book. To be truthfully honest I would have really rated this book quite highly if I could have said that this was even close to a finished copy. Instead there is way too much not going on so I can't even wonder if this is what the ending copy would be like. -Nest is often misspelled as next. -Captions are missing as well as some of the writing. Instead they have editorial comments on where and what type of information needs to be added such as Owl Menu discussions. -Pictures are being used with watermarks that are highly noticeable. Can't you find a way of noting your photographic sources in the background without distractions on the photo? -Uses plural words instead of single for individual creatures. -Used a picture in which the author was unable to identify the species mentioned even though this is a book about North American owls. -Missing page numbers in captions and so refers the reader to look at 00. -Blank pages for owl species identification. -An instance in which words need to be flipped around so instead of reading human attack it should be attack human. As for what I did really enjoy was how this book was put together. 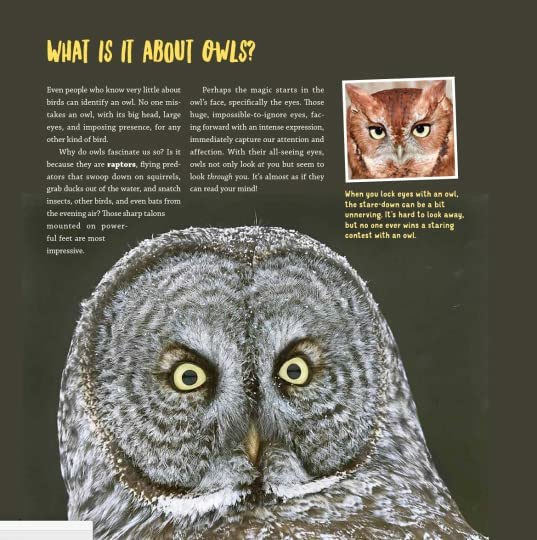 Each section of the book allowed the reader to get a clear explanation of the owls, what makes them different from other birds, owl etiquette and classroom projects that revolve around these amazing birds. I also enjoyed the fact that a section was given to exploring the various species of North American owls. With the exception of the blank pages leading each entry there were normally a collection of pictures with captions, a few paragraphs to give more information on the type of owl is being mentioned, telltale marks and some of its habits as well as a small box that included food on the owl's menu. You can tell that the book was written by a professional who loves owls. As such the book is very informative but he does keep in mind his readers' predominant age group so there is a glossary in the back while the writing is simple to read, simple to understand and given in a concise manner. There are also some small biographies in the back of people who work with owls for a living just in case someone has their heart on working with these beautiful birds. Again I would suggest that this would be a highly recommended and praised of book in any other circumstances for birders of all ages or those who like or want to learn more about owls. Unfortunately until I know what the full copy looks like I will have to go with my given rating at this time. This book goes above and beyond the basic facts of owls, and without grouping wildly different species all together. They are often crepuscular, NOT nocturnal, as many others would have you believe. There are so many different sections, maps, diagrams, etc. that cover so much, without being overwhelming, and with gorgeous photos! As an owl enthusiast, I am thrilled to see a detailed, accurate book perfect for young owlers like I once was! Includes a broad introduction to owls and the characteristics they share, 2-4 page profiles of each species of owl found in North America outlining that species’ defining characteristics, followed by a guide for would-be owl watchers, and finishing with 1-2 page profiles of some people who hold jobs that let them work regularly with owls. This is not the type of book I’d hand to a kid expecting them to read straight through (unless they are a die-hard owl lover). I’d hand it to them expecting the Includes a broad introduction to owls and the characteristics they share, 2-4 page profiles of each species of owl found in North America outlining that species’ defining characteristics, followed by a guide for would-be owl watchers, and finishing with 1-2 page profiles of some people who hold jobs that let them work regularly with owls. This is not the type of book I’d hand to a kid expecting them to read straight through (unless they are a die-hard owl lover). I’d hand it to them expecting them to use it as a resource to identify an owl, gather information on owls in general or a certain American species specifically, or to explore various occupations that allow people to work with owls. It is a fantastic resource for each of those things providing extensive information on each one. And there are fantastic photos of all kinds of owls throughout to make owl lovers super happy. Recommended for schools and classrooms to have on hand for research, and of course, if you know an owl lover, they probably need this book. Owling is a fascinating look at the diverse species of owls found in the United States and Canada, perfect for young birders and budding scientists. 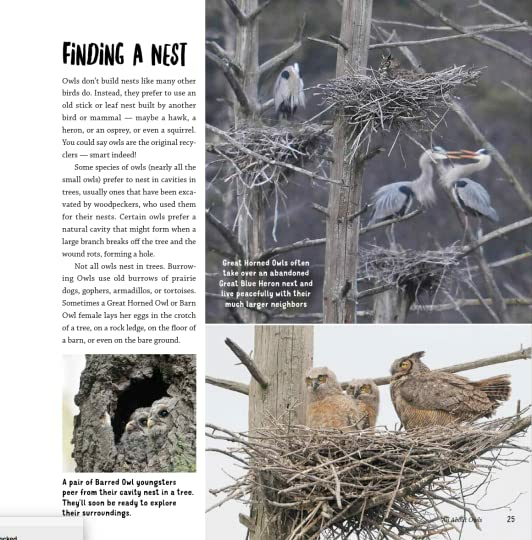 The educational, interactive text invites kids to observe and appreciate their local wildlife, and the gorgeous photos will be sure to inspire a newfound love of nature in all readers. Mark Wilson’s reverence for these incredible birds shines through in delightful anecdotes gleaned from his extensive scholarship. I’m eager to go on an “owl prowl” my Owling is a fascinating look at the diverse species of owls found in the United States and Canada, perfect for young birders and budding scientists. The educational, interactive text invites kids to observe and appreciate their local wildlife, and the gorgeous photos will be sure to inspire a newfound love of nature in all readers. Mark Wilson’s reverence for these incredible birds shines through in delightful anecdotes gleaned from his extensive scholarship. I’m eager to go on an “owl prowl” myself after reading this book, and Wilson offers practical, engaging advice on the best ways to see these birds in the wild while still being an ethical guest in their habitat. My thanks to Storey Publishing and NetGalley for providing a free copy in exchange for an honest review. I think this book is wonderful for young children with any interest in owls or birds. The photos were wonderful. The reasearch and explanations seem very easily digestible for young researchers, especially for any sort of project or report they may be doing. It is still readable for anyone looking for less of a fact driven book, but still contains wonderful bits of information. When I grabbed the boo I received a complimentary copy of this book through Netgalley in exchange for an honest review. This is a really terrific book, a perfect book for a child (or even a grown up!) who wants to learn more about these truly amazing creatures. Excellent photos and clear information, in a very accessible format. If you live in New England and have the chance to attend one of Mark and Marcia Wilson's owl presentations, don't pass it up--they are informative and fun, and it's awe-inspiring to see these birds up close. Recommended for ages 8-12. A fantastic book, with excellent images and quality information of the main species in North America. I was surprised by interesting data, for example that some species have adaptations for hunting such as asymmetric ears and other species have soft body feathers that dampen sound. Another fact that I did not know is that these birds do not build their nests, but use those left by other birds and even old burrows or tree cavities of mammals. The book has a brief explanation to build an owls house A fantastic book, with excellent images and quality information of the main species in North America. I was surprised by interesting data, for example that some species have adaptations for hunting such as asymmetric ears and other species have soft body feathers that dampen sound. Another fact that I did not know is that these birds do not build their nests, but use those left by other birds and even old burrows or tree cavities of mammals. The book has a brief explanation to build an owls house and the dimensions required according to the species. I found the section of experts who work with owls to be particularly significant, from the educational point of view, it gave my son and me a clear and concrete perspective of the efforts that some people are making to rescue and preserve the wild life. Therefore I recommend this book that provides a broad and sufficiently detailed overview of the owls of North America for elementary educational uses, for children and young naturists in training, and for the caregivers who want to accompany them on their journey of discovery. Absolutely stunning pictures of so many different types of owls and their habitats! A must have in every classroom and home. Enjoyable for children and adults. The author is extremely knowledgeable about owls on a personal level as well as a professional one. The information is truly eye opening and goes in depth into the world of owls! Fantastic! Everything you wanted to know about 19 North American species of owls. Learn about how they fly, see, hunt, eat and more. Owning will teach you how to identify the different species by the plumage or call, you can even learn how to hoot back! Full of stunning photography. An excellent resource for kids and adults alike on all things owl. 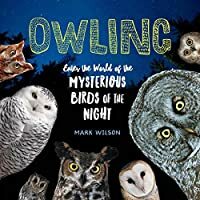 Owling: Enter the World of the Mysterious Birds of the Night by Mark Wilson is a children's nonfiction book currently scheduled for release on March 5 2019. Wildlife photojournalist and nature educator Mark Wilson presents a look into the mysterious lives of these distinctive birds. Images of the nineteen owl species of North America nesting, flying, hunting, and catching prey are accompanied by information about the birds’ silent flight, remarkable eyes and ears, haunting calls, and fascinating Owling: Enter the World of the Mysterious Birds of the Night by Mark Wilson is a children's nonfiction book currently scheduled for release on March 5 2019. Wildlife photojournalist and nature educator Mark Wilson presents a look into the mysterious lives of these distinctive birds. 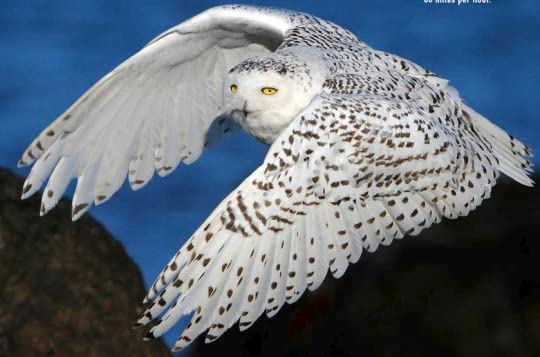 Images of the nineteen owl species of North America nesting, flying, hunting, and catching prey are accompanied by information about the birds’ silent flight, remarkable eyes and ears, haunting calls, and fascinating night life. Kids will learn how to spot owls; identify their calls, plumage, and pellets; and even carry on a hooting conversation with a nearby owl. Owling is a well written book about owls. The pages are bright and bold, with full color photographs and diagrams. The text is broken into manageable portions, with fun questions and facts scattered through the pages to further engage readers. I really enjoyed seeing the differences and similarities between different kinds of owls. I also found the detailed information about each of the native North American owls to be well organized and written. I found the information on finding owls, and on how to make my yard and the environment in general, more owl friendly to be very helpful and responsibly done. I like getting information like this, which benefits the wildlife I love as much as myself. I also found the chapter on working with owls to be extremely interesting, since animal rehab or working in a zoo environment is likely to be in my daughter's future is current trends continue. The glossary and other resources in the endpapers were useful as well, and I think will help encourage young readers to explore further. One of my aims is to see an owl in the wild as they are my favourite bird. . Husband has seen them a couple of times while we have been out walking late in the evening but I never have. So I loved all the information provided and how it was presented in a readable, understandable way. The photographs and illustrations just added to the high standard of this book. There was so much I hadn't realised about owls before i.e. that they have different coloured eyes and i never realised their ears were One of my aims is to see an owl in the wild as they are my favourite bird. . Husband has seen them a couple of times while we have been out walking late in the evening but I never have. So I loved all the information provided and how it was presented in a readable, understandable way. The photographs and illustrations just added to the high standard of this book. There was so much I hadn't realised about owls before i.e. that they have different coloured eyes and i never realised their ears were at different heights. If there is anything you want to know about owls you would find it in this book - just perfect. This book is everything you wanted to know about owls and more. Beautiful photography and in depth information on owls. This is a great research book if doing a school report. From bones, different eye colors of owls, night vision, wing spans, nesting, and every type of owl you will not be disappointed in this book. It is worth having it for the pictures alone. Living in a rural area we have a number of owls the come and visit - one which we call the screeching owl, and a common barn owl that we have seen so far. They are lovely birds and keep to themselves much of the time. I found this a really interesting book about owls, written mainly with the North American owl in mind, it does cover a lot of basic facts about the making of an owl - eyes, ears, bones, neck and lots more, before getting into detail of north American species. I love owls and find t Living in a rural area we have a number of owls the come and visit - one which we call the screeching owl, and a common barn owl that we have seen so far. They are lovely birds and keep to themselves much of the time. This is an incredibly detailed non-fiction text for young readers. The images are all well selected and much of the information given is interesting. As far as its usefulness for a class read, I would suggest this veers toward being slightly too long and in too much detail about specific owl breeds for most primary aged children. I would consider having this in a school library as a reference book or for any child who finds this subject exceptionally interesting. 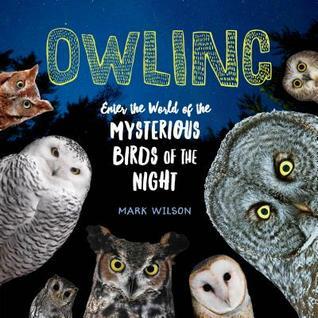 Through gorgeous photos and plenty of cool facts, Owling by Mark Wilson teaches kids about these beautiful birds of the night. Nineteen different North American owls are looked at. Learn how they fly silently, see so well, can turn their heads so far around, as well as learning how to identify different owl calls and feathers, and even how to carry on a conversation with a nearby owl. My cubs and I loved this book! We have great horned owls around us, and 'talk’ with them sometimes. We also have Through gorgeous photos and plenty of cool facts, Owling by Mark Wilson teaches kids about these beautiful birds of the night. Nineteen different North American owls are looked at. Learn how they fly silently, see so well, can turn their heads so far around, as well as learning how to identify different owl calls and feathers, and even how to carry on a conversation with a nearby owl. My cubs and I loved this book! We have great horned owls around us, and 'talk’ with them sometimes. We also have a ‘ghost owl’ (aka barn owl) in the neighborhood. I'm 100% convinced they are responsible for banshee legends. Recommended for those with an interest in nature! This is such a cool guide to owls! The intended audience was children, but as an adult, I was engaged throughout. There are copious pictures and diagrams, and the owls within are both adorable and majestic. A very solid work.